Banana Creek dissects Kennedy Space Center and northern Merritt Island & once connected the Indian River Lagoon with the Banana River (and making the "island" of Merritt Island. And of course, where needed, the Ais Indian mounds were bulldozed into the coastal wetlands to create the launch pads and Crawlerway. 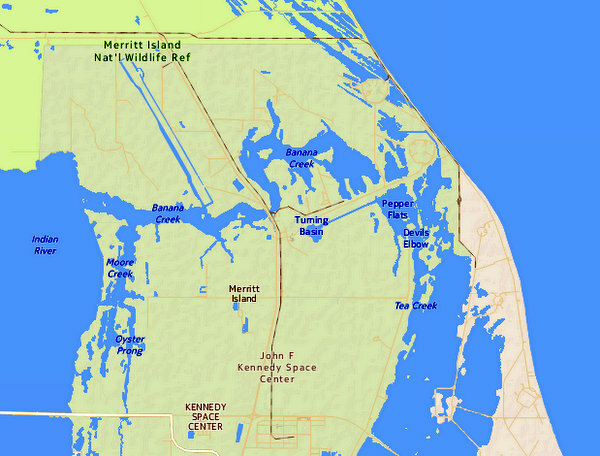 This "Pre" Kennedy Space Center map, shows Banana Creek twisting across Merritt Island (bottom center) This drawing was made before the Apollo era "Crawlerway" sealed the creek in half. 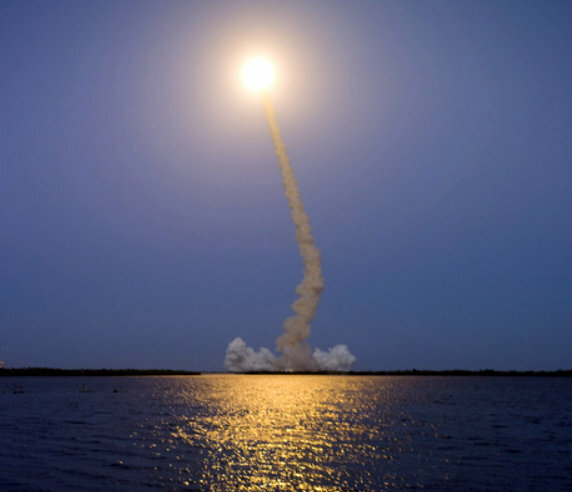 The SLS is going to ROCK the Space Coast. Morning fog over Banana Creek. Moving the Mobile Launch Tower out to Launch Pad 39B for a "Fit Test"--Excitement building on the space coast! Kennedy Space Center Launch Complex 39 area. In the background of the picture is the western entrance to Banana Creek and the space shuttle runway. As mentioned, Banana Creek is now closed to kayaking. However at the western entrance to the creek, where the area is open to the public; boats crowd the fishing area known as "Peacocks pocket" -an almost well kept secret fishing hole. On calm days, eager fishermen ply the "Pocket" for trout, redfish & tarpon swimming from the protected waters of the Space Center. Photo credit: Mine. I took the photo from the new SLS platforms. 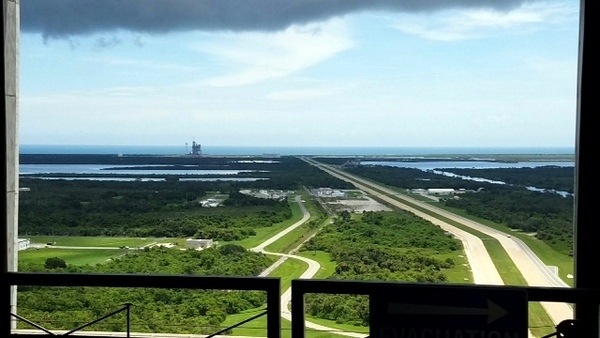 The opposite view from Launch Pad 39A (Space X pad now) shows a better view of Banana Creek and the Crawlerway that cut the creek in half. 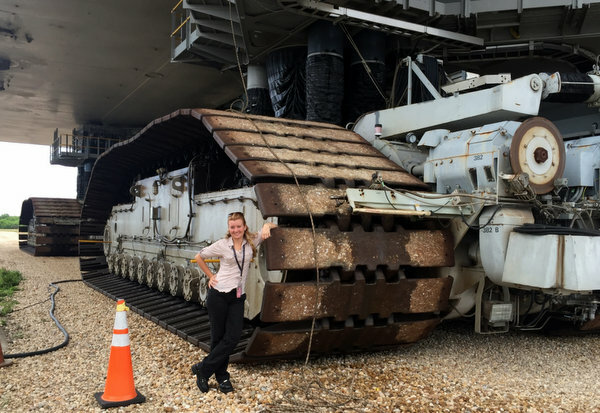 Perspective on the size of the crawler that carried the space shuttles over the filled in Banana Creek. Aerial photo of "Futch Cove" on Banana Creek. 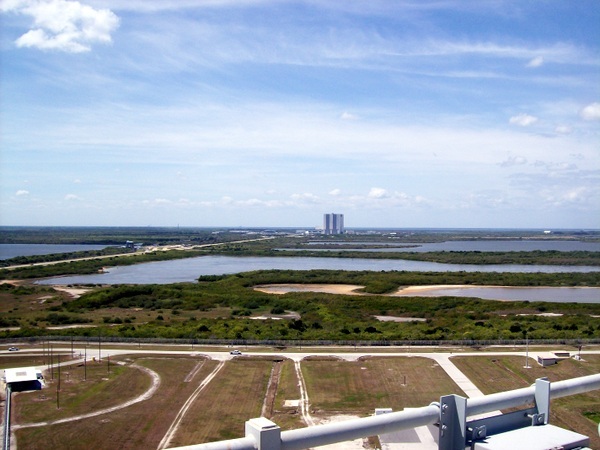 In the photo is the Saturn IV building and the Banana Creek viewing site/stands. I count 39 buses parked at the viewing site! View of Futch Cove from the viewing site looking into Banana Creek. 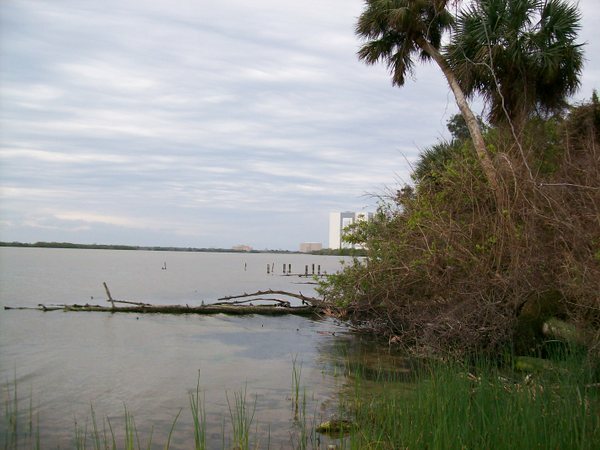 The remains of an old dock are still standing-reminders of the forced eviction of the residents of North Merritt Island to create the space center. Photo Credit: Mine: I took the photo while working on the south end of the space shuttle runway. The Ais Indians of Banana Creek. 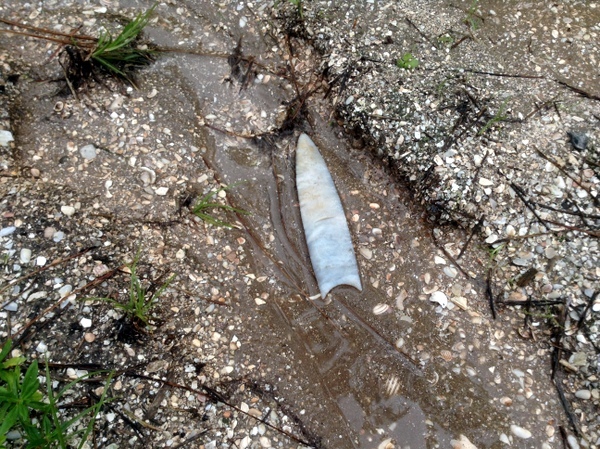 Mounds middens and portages.... Banana Creek can boast of both the largest Indian mound remaining on Kennedy Space Center and Futch Cove is the largest area of artifact debris. Happy Creek, a branch of Banana Creek was also one of the three native American portages on North Merritt Island used to carry canoes to the Mosquito Lagoon. 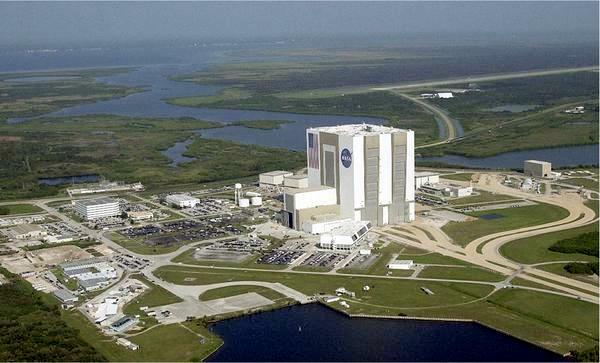 Consequently the Largest shell midden on Kennedy Space Center is located on west Banana Creek, directly opposite of the end of the space shuttle runway. 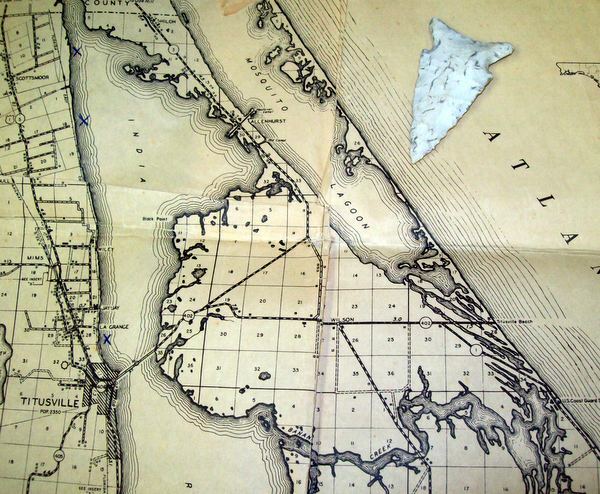 Shuttle Astronauts returning from orbit would glide directly over this piece of old Florida on their return to gravity. Hurricane Irma exposed a "pre Ais Indian" artifact. The naturalist William Bartram in 1774 in described Banana Creek as having "Clear flowing water with oyster beds"
The cartographer Álvaro Mexía in 1605 described the mound on (modern day Banana Creek) as being the capital of the Northern Ais clans (however he writes that Ulumay on Sykes Creek was the largest town. As mentioned on another page, I obtained from the local library the pre-WWII book of when Smithsonian dug up the Banana Creek mound and recovered silver artifacts. (gold was mysteriously missing) Fascinating book if you are into old school archelogy "Tomb raiding-Dig here style" before archelogy became a real science. So anyway, I read this book and then had the absolute pleasure to visit the same Ais midden mound on the south shore of Banana Creek. I was assigned to assist in repairing the cabling to the PAPI lights (shuttle landing lights) and my lunch hours were used judiciously to observe this mound. Upon first look I was disappointed that the Smithsonian had not back filled their exploration (raiding) pits, as the mound is still pock marked with holes. But then I recalled; as mentioned on the Sykes Creek page, when I was first stationed to the Cape in the USAF, I took an archelogy course at the local college taught by Archeologist Bud Knoderer. Dr. Knoderer loved to recount that in the 1960s as the space center was being constructed: that the Chief of Security for NASA dug into every mound on the space center and eventually sold his GOLD recovered from burial mounds for $8000.00 (in 1968 gold values that works out to him selling 20 pounds of gold. If I did the math correctly that would be around $315,000 in todays value) -- I would hope it would be worth the prison time. Note: if Álvaro Mexía was correct is identifying the cacique (king) as living on the Banana Creek mound, it would only make sense that treasure found along the coast went to the king and was consequently buried in the West Banana Creek mound. Paddle around the bend from Futch cove and you reach the Happy Creek branch-even more sheltered than other locations and the land around Happy Creek is higher than other parts of Banana Creek. In the 60's a burial mound-(not just a midden) was bulldozed to build the current 250 meter tower and supporting guy wires, located on the east side of Happy Creek. Pottery shards can still be found beneath the tower. My guess is the high land around Happy Creek was the burial location for both communities of Futch Cove and the west creek midden. 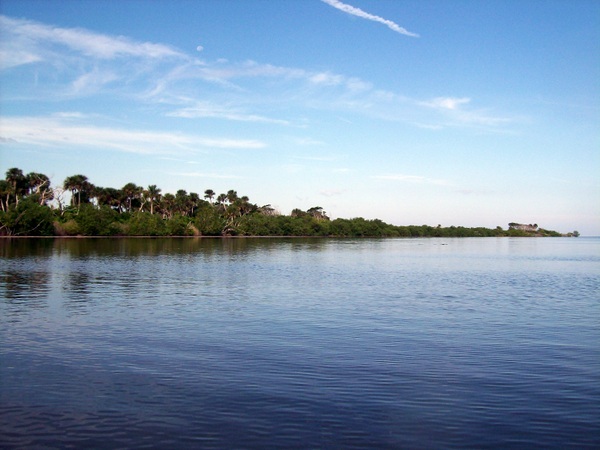 From Happy Creek it is approximately 3000 steps to one of the feeder streams to Max Hoeck Creek/Mosquito Lagoon. Any easy walk for a twenty or so Ais carrying a boat. In Conclusion, Banana Creek is like other areas of the space coast: the past is not really past & in fact, past, present and future blend to fulfill the old proverb: "May you live in interesting times"